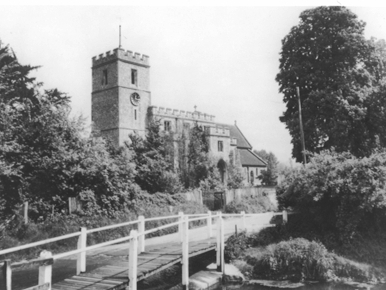 If, like me, you take pleasure in listening to the peal of our church bells I am sure you will have enjoyed reading last month?s informative article on the Bells of St Mary?s. 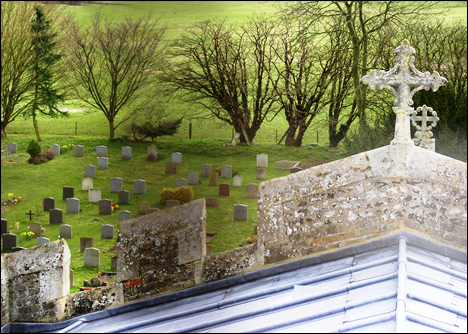 It occurred to me that it might be a good idea if I could photograph the bells in the church tower. So one Saturday morning I was invited by Chris Carter and his son Matthew to go up the tower as they were going to carry out some routine maintenance. The dedication of the bell ringers extends to more than practice on Friday and ringing for the Sunday service; the bells, ropes and fittings need a good deal of attention and servicing if they are to ring smoothly. This involves scaling the tower for regular inspections of the bells and bell frame which is housed on the second floor. So it was that I ascended the first ladder some 30 feet to the first floor. On the first floor is the clock chamber with its grand looking clock mechanism, a three-train, weight-driven, turret clock manufactured by William Potts of Leeds, and installed in 1905. 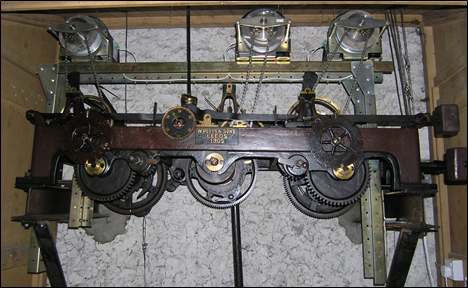 It used to need hand winding and weights re-setting every two to three days, but two years ago it was converted to an automatic winding system. The clock chimes the quarters and hours using the bells numbered 2 through 6.